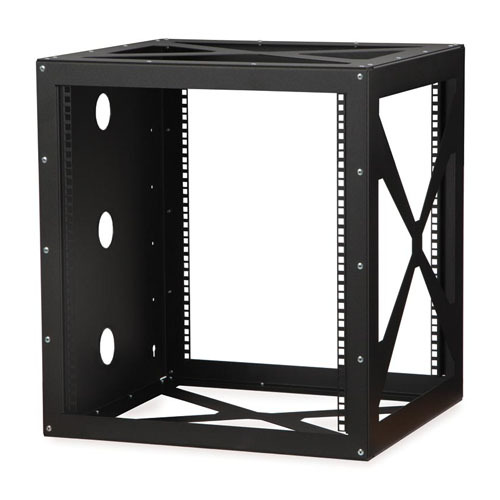 Space Saving Design: When you do not have space for a full-size server cabinet or when hanging larger, deeper components on the wall are necessary, the Side Load Wall Mount Rack gives some of the same benefits you get from a 4-Post rack or cabinet in a much smaller footprint. The low profile design is only 21" off the wall, making it a true space saver. Equipment Access: Easily access the front and back of your network equipment without having to twist, pivot or swing-out the rack. This open design provides installers unlimited access to equipment from just about any angle. Strength and Durability: The heavy gauge steel construction and textured powder coat finish provide a solid, reliable wall mount racking solution. Front and Rear Rails: The fixed set of front and rear (which are really left and right) cage nut style rails provide a 20" mounting depth for equipment that requires a 4-point mounting.